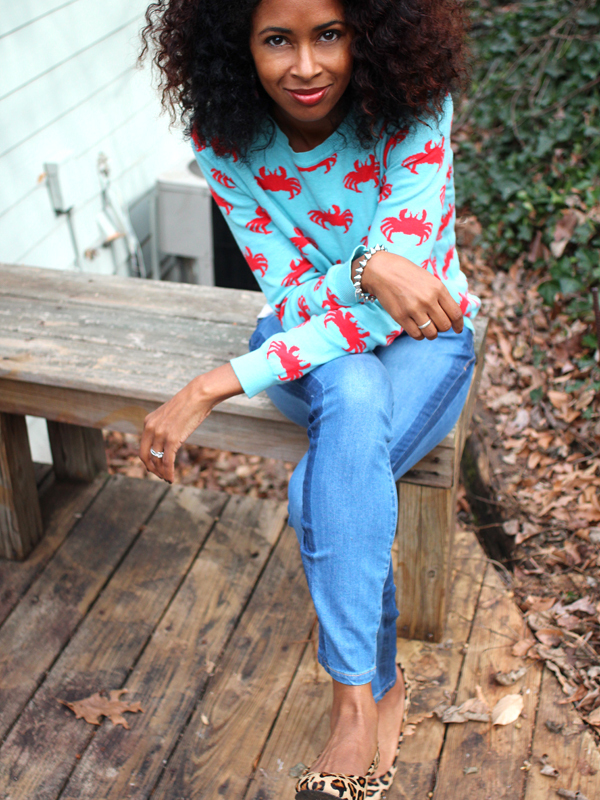 So, I'm wearing a sweater covered in crabs. Look here, my zodiac sign is Cancer--and I'm a Cancer to the core. Sometimes outgoing--sometimes introverted (in our shell). That is ME. Hella emotional?--ME! All about home and family--that use to confuse me during my single years but who knew?! It's so me! So, of course, when I stumbled upon this sweater on Forever21.com, I had to cop it. You put a crab on it, I'm going to buy it! You put crab IN it--I'm going to eat it! Okay, that may not have been the best thing to say. Anyway, I'm in love with this sweater, though it feels more like a sweatshirt. And no, your eyes aren't deceiving you... yes, I paired it with leopard. If you haven't figured it out by now, leopard print is almost a neutral these days. You're wearing stripes?--pair it with leopard. Polka dots--pair that sh*t with leopard! Anyway, last week I'd been sick for DAYS with the flu. I took these pics as soon as I felt "cute" again. I know a lot of you have been wanting to see the hair color in natural light. There it is. It's red. I'm going to add more. I lighten little by little, just so I can control what the hey is going on. All I can say, is I doubt I'll go back to black for a long time. Nik everytime I visit your blog, I fall deeper in love with your hair! IT'S GORGEOUS! I need to embrace my curls more often. Its sooo much work though! UGH! LOL! I'm not a cancer, but I LOVE me some crabs! LOVING this sweater! SUPER DUPER cute! Glad to hear your feeling better. I think I'm coming down with something. Thank God the weekend is close by! Stay pretty! I giggled at parts of this post. And you're right, leopard goes with everything. such a great outfit! loving your pants too. Thanks for all the well wishes. I am MUCH better! Hello! Just found your blog through the Lucky Community! Great blog, now following! I had the flu recently too! Feel better! Um, you are TOO CUTE! I love this outfit. And your hair is amazing. Cute Sweater! I love your hair! hi dear, you are just gorgeous! i love your style and i love your blog ..i was wondering do you want to follow each other? 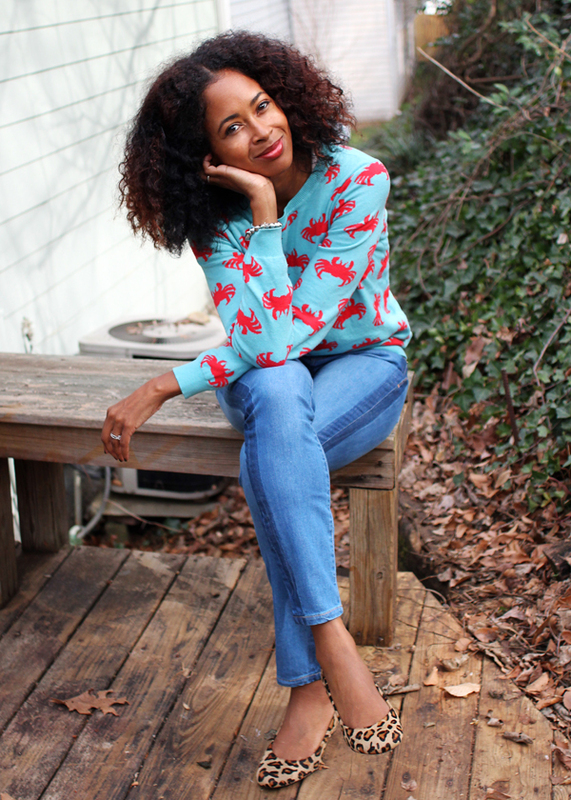 LOVE your crab sweater! 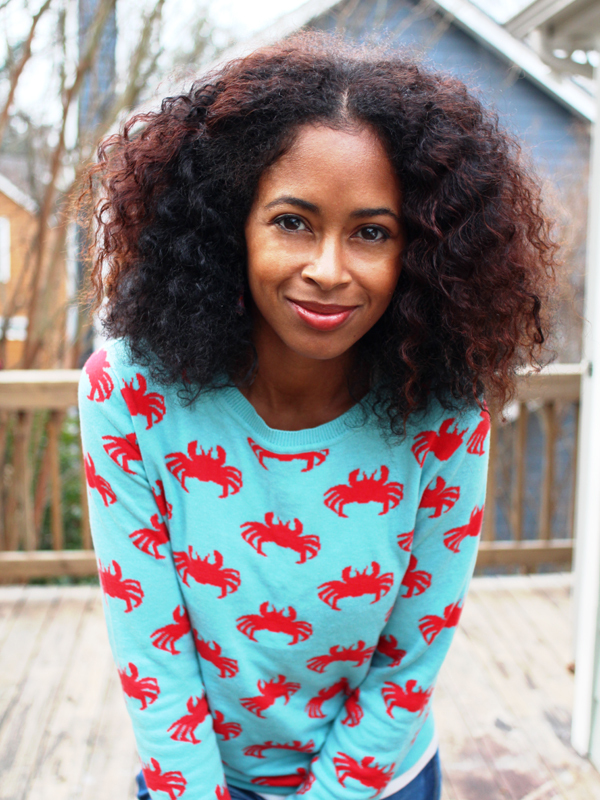 I'm not a cancer, but I would mos def rock it...and I will eat anything with crab in it, too. Lol!! You're gorgeous, by the way...love your hair! ....and leopard is DEFINITELY a neutral. Love your hair here. How did you create the soft waves? Blown out braidout? I think the shoes add a great twist to the look. And they look comfortable! Anon--This is a braidout done on hair that airdried about 75% in one ponytail braid. I then put in about 7-8 braids, and slept in them overnight. You look gorgeous! Your hair is sooooo gorgeous. You own that cut and color girl! 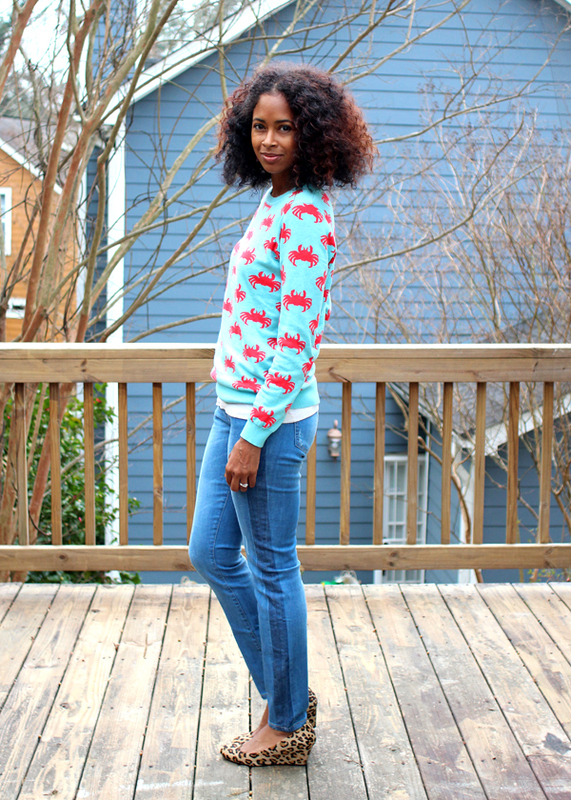 I love the sweater and pairing it with leopard. Great post! Thanks for stopping by TFH!! !